It could happen to any of us at any time that we suddenly become persons of interest to the deep state: a sweet wrapper carelessly dropped, a rash remark on a bus about the dear Duchess of Sussex taking her baby and her ginger princeling to live in Africa – you never know. 'Be prepared' is our motto on this website, so if one day you may want to move around without attracting the interest of recognition surveillance cameras here's our useful tip. The details are contained in the researchers' recent paper (PDF). H/t The Register. Rather untidy people like these two will probably need to avoid surveillance anyway. Our research has shown that the best solution is to walk around in an oversize white t-shirt with on its front a large colour image of Donald Trump wearing a MAGA hat. You will then be able to walk through any public place without the least risk of being noticed. In our scrapbook for December last year we brought you some astonishing photographs of the extreme climber David Lama doing what extreme climbers do: rolling the dice. The dice fell badly for him at the beginning of this week during a difficult (what else?) ascent of the east face of Howse Peak, in the Banff National Park of the Canadian Rockies. David Lama (28) and his two climbing partners, Hansjörg Auer (35) and Jess Roskelley (36) died in an avalanche. At the time of writing their bodies have yet to be found. Update: Recovered on 21.04. It's 05:44 on Sunday morning and James Higham is hollow-eyed with Weltschmerz. He is beset by all the lunacy in the world and the simultaneous realisation that he can do nothing at all against it. A pretty realistic point of view, in fact. He can do something, though. He can disconnect completely from all social media and drastically restrict the number of websites he visits. Turn off the TV, the radio, the computer, the tablet and the smartphone. Stare into the void that is left, the void called modern life. After a day or two of withdrawal he will be much happier. Those born before, say, 1970, should think back to the way things were before our lives were polluted and taken over by these technological monsters, a pollution which started with rolling news on TV. In those days we could get angry, particularly with our useless politicians and all the other idiots of the world, but we got the idiocy in small doses diluted in the massive reality of normal life. We could cope with that. Now we are driven mad by knowledge, day in, day out. A vision of worldwide uselessness, mendacity and wickedness passes before us every day. Because we are human, we are driven to want to do something on the basis of that knowledge and driven mad by our impotence. For we are utterly impotent. In which case, why bother? If you believe in the Christian God and believe that He is omnipresent and omniscient, you can only conclude that He, too, has probably been driven mad by His permanent insight into the terrible defects of humanity. Even the Almighty cannot help you these days. The recipe for sanity? Put the blinkers we used to wear back on, chomp calmly in your nosebag and be happy that it is full of oats. We are the modern utility animals, who have nothing to do but plough the furrows, be grateful for what we get and keep our opinions to ourselves. Who never ate his bread with tears, who never sat on his bed weeping through the sorrow-filled nights, he does not know you, you heavenly powers. Johann Wolfgang von Goethe. Wilhelm Meisters Lehrjahre, Chapter 13. 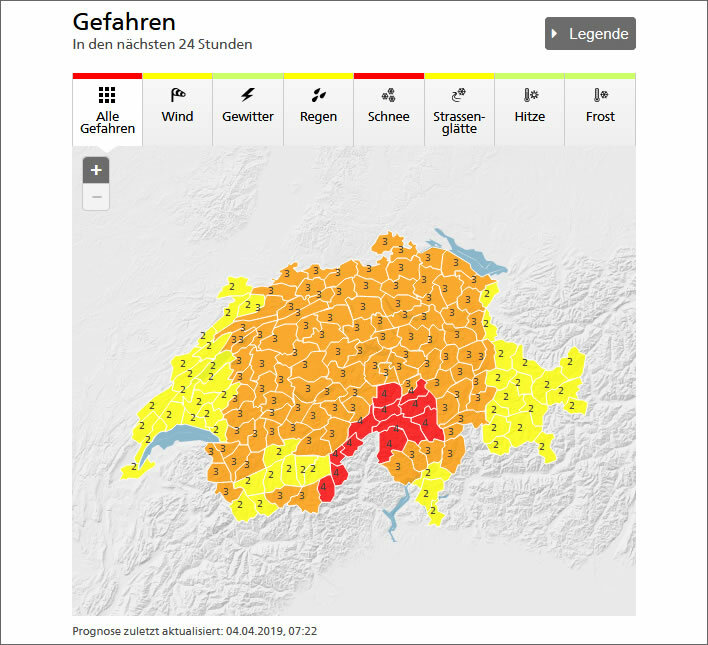 Image: MeteoSchweiz, das Bundesamt für Meteorologie und Klimatologie. You can imagine what that looks like now. No? Forgotten what snow looks like? In a wonderful climate irony, the Zurich TagesAnzeiger brings us today a massive article listing 75 things the individual citizen can do to make sure that more of this annoyingly unseasonal stuff falls on us. Ross Clark in the Spectator Coffee House puts his finger on the basic problem with the Brexit process: there are really only two options, remain and leave. Remain will lead to political and social turmoil; leave will lead to some temporary disruptions. No compromise or intermediate position is logically possible. We wrote just over a year ago on May's idiocy in having a cabinet equally balanced between leavers and remainers. Every fudge in between those two positions is in effect remain. The great weakness in Richard North's Flexcit plan (and all such similar proposals) is its political naivety: once Britain has performed some shuffle into another not-quite-a-member condition, whether one foreseen by the Withdrawal Agreement, or Norway.n or a SingleMarket.n or EEA/Efta.n or any of the many other cunning plans, there is no guarantee that there will ever be a sufficient political will to continue the process and cut the final ties. On the contrary, the pressure to re-integrate with the EU will be unrelenting: there will be a continual requirement to harmonise with all future EU regulations, which will keep the UK in lockstep with the EU forever. Can anyone expect a UK government of any colour to hold its nerve on the issue of Brexit for, say, twenty years? It is a well established constitutional principal that a Parliament cannot bind its successors. It is perfectly possible that a future government and parliament could simply decide to slither back into the EU. Unlike leaving, that step would be almost frictionless. Circumstances could be found that would make this seem a rational step, perhaps the need to have more say in the corridors of European power. Perhaps some Gordon Brown Mk. II might shimmer unseen once more through a back door in some European capital to sign the necessary papers. Voters will have no influence on this backsliding: during any transition period the ballot box will play as small a role in EU politics as it did before the referendum. Voters are allowed to vote for people and parties, not issues – historically, single issue candidates get nowhere. UKIP never got a single candidate elected as an MP, even their most charismatic one. The main difference will be that the UK parliament will now never sanction any further referendum: it has had enough of referenda for a long time. The Labour party will never dabble with the EU issue and the Conservative party will silence all anti-EU views in its ranks just as it did before the referendum. So, under pressure of circumstances, what can stop a re-integration? Nothing. One of the few sensible voices during the last two and whatever years of the Brexit process has been the Conservative MP John Redwoood. Unfortunately he and many like-minded Conservative MPs have been sidelined for decades in the Conservative Party's idiotic attempt to be more like Blair's New Labour. The small-c conservative is filled with despair at the possibility of yet another leadership election between all those unpalatable Tory flakes. But, throughout the Major years, the Blair years, the Brown years and the Cameron years we have consoled ourselves by saying that the electorate gets the government it deserves. It seems that, whatever the outcome, this will be the case at the next election, too.